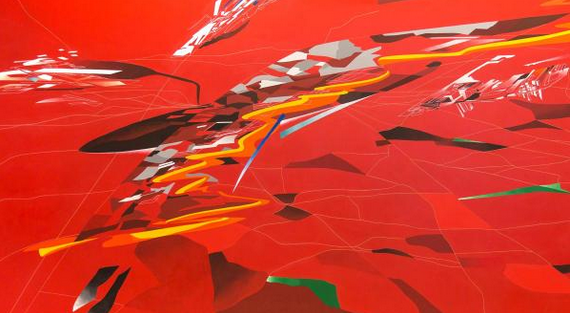 The passing in March of the visionary architect Zaha Hadid was just one of the dark passings that have splattered this Grim Reaper of a year with ink dots, but for us art lovers it felt like an especially abrupt departure. Hadid was such a positive presence, so revolutionary in her work, such a force of life, that death was the last thing we expected from her. But that’s 2016 for you. It’s the year that took no prisoners. Where we are lucky is in the legacy she has left behind. There’s lots of it. We have an eternity to enjoy it. And new bits are still being added. Serendipity has ensured that two fresh helpings of Hadid, in different forms, have arrived before us, timed perfectly to cheer us up for the year ahead and top us up with hope. 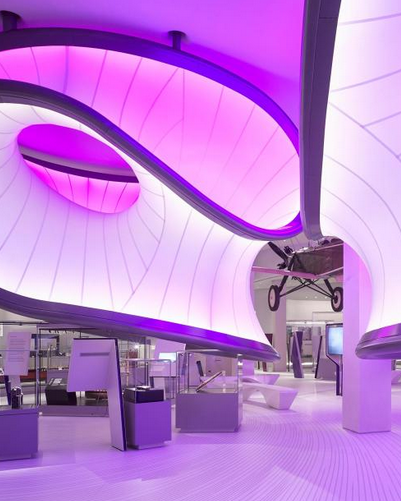 The Winton Gallery, a new space devoted to mathematics designed by Zaha Hadid Architects for the Science Museum, is clearly a location that nurses huge transformative ambitions. So different does it feel from the rest of the building that walking into it seems to involve a leap into another dimension. What’s to transform, you might be thinking? The Science Museum is a science museum, right? Indeed it is, but if you are over 20, which I assume most of you are — otherwise you’d be watching Snog Marry Avoid? rather than reading this — allow me a question: when did you last go to the Science Museum without a child in attendance? Put up your hand if you, a sentient adult, have ever visited the Science Museum purely because you wanted to savour its fabulous collection on your own. I bet I could count the hands being lifted on one hand. In my case, it has never happened. I’ve taken my kids there. I’ve picked them up from school trips. I’ve reviewed events there. But I’ve never woken up of a morning and thought to myself: today I’ll go down to the Science Museum and check out the steam machines. The idea has never crossed my mind. The Science Museum, in my reading of its function, is somewhere you take your young ones to excite them about science. That, though, was obviously not Hadid’s understanding of its function. The new gallery she designed for the museum’s mathematics collection is a honeytrap for poetic adults if ever I saw one. Floaty, mysterious, angelic, this fabulous modernist grotto greets you with a blast of white so fierce, it instantly blots out its surroundings and jet-packs you to a different museum experience. Outside are the school groups, the infotainment, the interactive toys. Inside are walls that bend cosmically this way and that, a space that feels sculpted rather than designed, an environment that fills you with wonder. Whoever created this space studied at the University of the Cosmos, you’d guess. In short: pure Zaha Hadid. The bendy walls are actually mathematical projections of the airflow around the gallery’s central exhibit, a full-size plane hanging from the roof, the Handley Page Gugnunc, an aircraft built in 1929 specifically “to transform public opinion about the safety of flying”. Airflow mathematics made the Handley safer. The same mathematics have now been solidified and turned into architecture: pure Zaha Hadid. Around the plane, the bendy white cave modelled on its airflow is filled with 120 objects that have transformed human history. They come from the worlds of technology, economics, science, geography, even art. All of them owe a creative debt to mathematics. There are cabinets of weights and machines for predicting sea surges. Pocket calculators and abacuses. Drawings by Turner from the time when he was professor of perspective at the Royal Academy. An Enigma machine. A prototype of the cash till. A beautiful Islamic astrolabe. Each exhibit has a story to tell in the march of human development. It’s a display, therefore, on the British Museum model: a history of the world in 100 objects. I found myself uplifted by something pure, floaty and mysterious: the beauty of maths. Believe me, it was unexpected. Hadid, I read, studied mathematics before she studied architecture. It was always a subject close to her heart. Apart from transforming the Science Museum into a location for excited adults as well as excited kids, her mathematical bent is fully in evidence in the selection of paintings that has now appeared at the Serpentine Galleries. She clearly had no difficulty hopscotching between the arts. Her pictures, you feel, are an extension of her architecture, just as her architecture was an extension of her maths. Or was it the other way around? The Serpentine has brought together a selection of key paintings from across her career, starting with her graduation piece from the Architectural Association, made in 1976 and called Horizontal Tektonik, in which she pays tribute to the Russian revolutionary art of Kazimir Malevich. Squares, curves, rectangles and lines float haphazardly in space like shapes glimpsed in a kaleidoscope. But where Malevich gave us only the shapes themselves, Hadid gives us shapes that look architectural, as if a modernist city has been broken down to its component parts and the bits sent into orbit. The paintings that follow grow bigger, wider and multipart, but the opening sense of deconstruction — of cities being dismantled rather than assembled — continues through the show. Metropolis, from 1988, is a huge red picture in which we seem to be looking down on a London being blown apart by a cosmic storm: bits of city everywhere. The bright red of the background feels once again as if it has been borrowed from the Russian suprematists. But the gigantic scale comes surely from abstract expressionism. Excuse the isms. The sense of enacted theory and mathematical calculation that is missing from the wondrous Science Museum gallery is not, alas, missing from these pictures. Hand-painted though they are, they have about them the air of computer projections, as if the flying city shapes and soaring perspectives have been worked out on isometric software. As paintings, they are initially intriguing, but eventually repetitive. What remains puzzling about them is the sense they all have of taking things apart rather than putting them together. As if architecture were a way of unbuilding rather than building. Hadid, I’m told, would use the paintings in her pitches. Their task was not to envisage the final product, but to entice the client into giving her the job by cunningly evoking a universe of possibilities. Here’s a box of Lego. What shall we make out of it? More evidence, if we need it, of the seductive power of nothingness. To prove that deconstruction is indeed the chief flavour in art right now, the 2016 Turner prize has gone to Helen Marten, as I predicted. Her mysterious sculptures, assembled from lots of scraps of varied stuff, never coalesce into an obviously coherent whole. The story they tell you is mainly an internal story, a game of poetic connections between one part of the sculpture and the next. I like them, and they are worthy winners. But there is definitely something timid about them, as there always is with deconstruction. Itsy-bitsy and intriguing is always less of a risk than coherent and whole.